During the course of our research, we have come across a number of web sites that you too may find useful. These sites can be viewed by clicking on the relevant category below. We hope that you find these sites as useful as we have. Please note, in order to make this list of links easier to view, all the sites have been sorted into alphabetical order. After Cancer.com offers advice about coping with side effects from hormonal drug treatment following cancer, to give UK patients and oncologists more information about approved products we can use in the UK. Information for charities and about charities in the Bailiwick of Guernsey. This non-commercial site provides details of all local charities (with links to their websites if applicable) as well as guides and information that may be useful to charities and voluntary organisations. Any charitable organisation based in the Bailiwick of Guernsey can join the Association of Guernsey Charities - there are now over 230 members. Breakthrough Breast Cancer is the UK's leading breast cancer charity and is committed to fighting breast cancer through research and awareness. Penny Brohn Cancer Care is the UK's leading holistic cancer charity that has pioneered the Bristol Approach to cancer care, for people with cancer and those close to them. Cancer Buddies Network (CBN) has created a safe and friendly environment for those who have had cancer themselves and for friends, family and carers too. It is a great place to give and receive all the online cancer support and friendship you need from people exactly like yourself. This cancernet-UK website describes the management of cancer, its therapies, their side effects and tips how to cope with them. Patients themselves have included topics, practical tips and tools they have found helpful during their cancer journey. These pages emphasise the evidence and benefits of lifestyle after cancer to improve well-being and reduce the risk of relapse. will complete your job quickly with the greatest care. The Pink Ladies used the duplication centre for copies of the DVD of our 2009 Coastal Sunset Walk and were delighted with the service and price. If you suffer from a lung condition or COPD or a friend or member of your family does, you may be interested to know that the Guernsey Healthy Lung Support Group is here for people like you. The Pink Ladies are delighted that M&S Guernsey are donating 1 from every post surgery bra sold. Visit their website for more information. National Conference Of Cancer Self Help Groups - Started in 1984, by a handful of cancer patients. The conference now attracts hundreds of delegates annually and is recognised as being a leading event in cancer self help and support. NHS Direct Online is a website providing high quality health information and advice. Pleural mesothelioma is the most common type of mesothelioma, a rare cancer that develops in the lungs. It is almost solely caused by exposure to asbestos, which was used in everything in children's toys, house-hold insulation, and naval carriers. Our website has the most up to date and comprehensive information about Pleural Mesothelioma on the web today. With information ranging from a complete list of symptoms, to treatment options, and steps to take after a diagnosis. The LSN is a national charity which was founded in 1991 by a group of people with lymphoedema. The Charity provides information and support to people with lymphoedema. It runs a telephone helpline, produces a quarterly newsletter and a wide range of fact sheets, self-help videos and maintains an up-to-date website. It works to raise awareness of lymphoedema and campaigns for better national standards of care. The National Cancer Institute - A site containing lots of detailed information on cancer. The pain support website has been designed for anyone who has pain of any kind. PainSupport promotes a multi-disciplinary approach, where conventional medicine and complementary therapies work side by side. The Young Survival Coalition (YSC) is the only international, non-profit network of breast cancer survivors and supporters dedicated to the concerns and issues that are unique to young women and breast cancer. 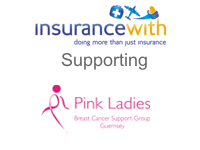 Insurancewith are supporting various charities, including the Pink Ladies, through the sale of insurance products under the insurancewith brand. We donate 1 pound for every travel insurance policy purchased from us. We also and possibly more importantly offer travel insurance to people suffering with pre-existing medical conditions at highly competitive premiums.